(Central Islip, N.Y., Sept. 20, 2017) - The Somerset Patriots (1-0) defeated the Long Island Ducks (0-1) 7-1 at Bethpage Ballpark on Wednesday evening to take Game One of the Liberty Division Championship Series. 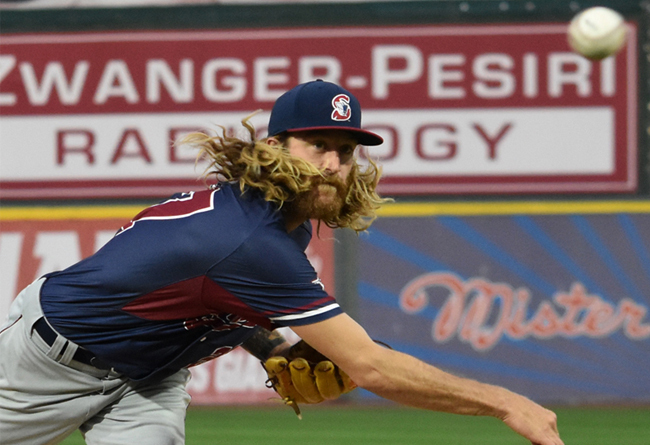 Mark Hamburger (1-0) pitched seven strong innings, allowing just one run on eight hits and seven strikeouts on 118 pitches. Offensively, Somerset was led by Olmo Rosario, who went 5-for-5 with two RBI. He got the Patriots on the board with an RBI single in a five-run third inning that also included an RBI base hit by Joe Maloney and three more runs on a pair of errors. The Ducks lone run came in the top of the fourth inning on an RBI single by Anthony Vega to cut the lead to 5-1. Rosario struck again in the top of sixth inning with an RBI single to centerfield. Kyle Roller followed with a base hit that put Somerset up 7-1, which would be the final. Every Somerset starter had at least one hit in the game, with Alfredo Rodriguez and Tyler Bortnick each recording two singles. Rodriguez also added two runs in his 2-for-5 performance. The Liberty Division Championship Series continues in Central Islip on Thursday night when Somerset’s LHP Mike Antonini (2-1, 1.61 ERA) takes the mound against Long Island’s RHP Matt Larkins (9-7, 3.69 ERA) at 6:35 pm. Game Three of the series is scheduled from Friday, September 22nd at TD Bank Ballpark with a Postgame Fireworks Show. For tickets, visit www.somersetpatriots.com.